The What: RCF (booth 6953) has launched the MZ8060, an 8x6 digital audio matrix mixer built on the foundation of the company’s RDNet DSP platform. It will be on display at InfoComm 2017. The What Else: The MZ8060 features eight universal mic/line inputs with 48V phantom power, and six balanced outputs along with 10 programmable logic inputs and six programmable logic outputs. It features 40-bit floating point processing DSP and 48kHz, 24-bit analog/digital conversion, with a dynamic range of >112dB. It also features configurable parametric EQs, gates, compressors, limiters, delays, priority levels, automatic gain control, levels, gains on in-out and cross points, and auto-mixer operation. With its Room Combiner functionality, each unit can work as a dual-room combiner with independent auto-mixer facility for each room. The MZ8060 has configurable ALC (Automatic Level Control) by using Input 8 to connect a noise detection microphone. The control is then assignable to any output or group of outputs. 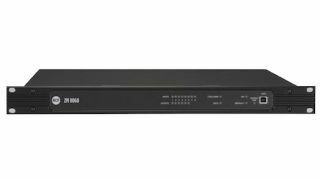 Its serial port allows for control of unit form third-party system such as Crestron and AMX, and USB connectivity on the front panel allows for easier device configuration. The mixer is linkable, allowing for two units to be linked in master/slave configuration to create a 16-input, 12-output matrix, and up to 12 BM 3003 mics can be daisy-chained to the system via its dedicated RJ45 port. The Bottom Line: RDNet is a proprietary protocol for RCF loudspeaker products that provides dedicated networking software for controlling and monitoring all system components and parameters. The DSP allows for configurable system programming including room combining, automatic level control, along with all audio input and output criteria including EQs, gates, compressors, limiters, delays, priorities, and levels.